The tens of thousands of items comprised within Special Collections and Archives are organized into subsections based on common themes, such as community and university archives, rare books and maps, and Vincentian Studies. Guides allow individuals to explore specific topics within the broader collections, like geography, student life at DePaul, and urban renewal and the Lincoln Park Campus. Special Collections and Archives is open to all, and staff members are on hand to answer questions and help users identify resources of interest. More than 900 researchers frequented Special Collections and Archives last year, and 66 professors brought their students for classroom instruction sessions. Valentina Tikoff, associate professor of history, incorporates visits into most classes that she teaches. Students from her transatlantic world course inspect Spanish and French accounts of indigenous peoples, while her enlightenment class browses an early edition of John Locke’s seminal text, “An Essay Concerning Human Understanding,” among other items. 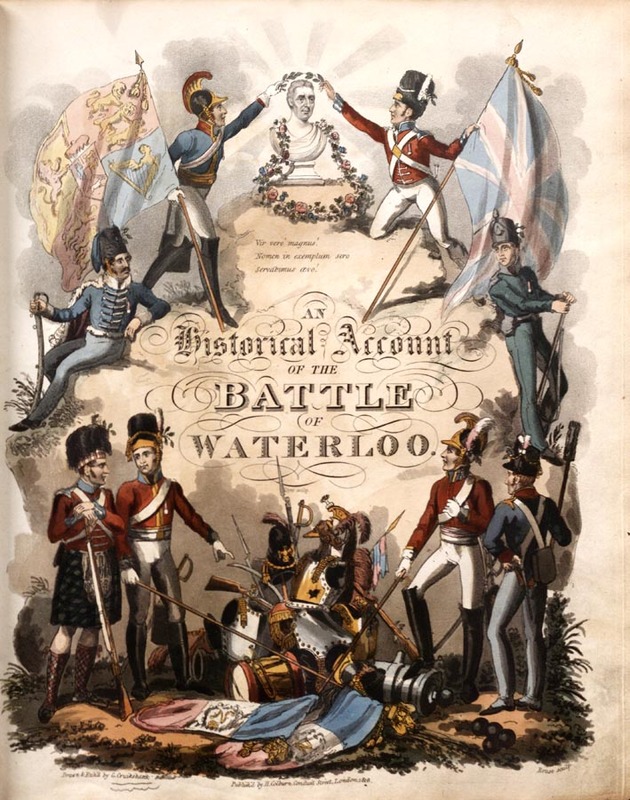 This illustration from an 1817 book by William Mudford depicts British and Prussian forces following the Battle of Waterloo. Central to the university’s identity, the Vincentian Collection includes eight letters written by or on behalf of St. Vincent de Paul. These letters—drafted between 1641 and 1660—range in topic, and Rea encourages students to handle the letters, which are encapsulated in archival plexiglass. “Vincent held this,” he stresses. “Vincent wrote this. That immediacy is important for students to understand.” With this pedagogical aim in mind, Special Collections and Archives, along with the Rev. Edward R. Udovic, C.M. (LAS ’76), university secretary, vice president for teaching and learning resources, senior executive for university mission and associate professor of history, began amassing materials to bolster the university’s perception of its namesake. 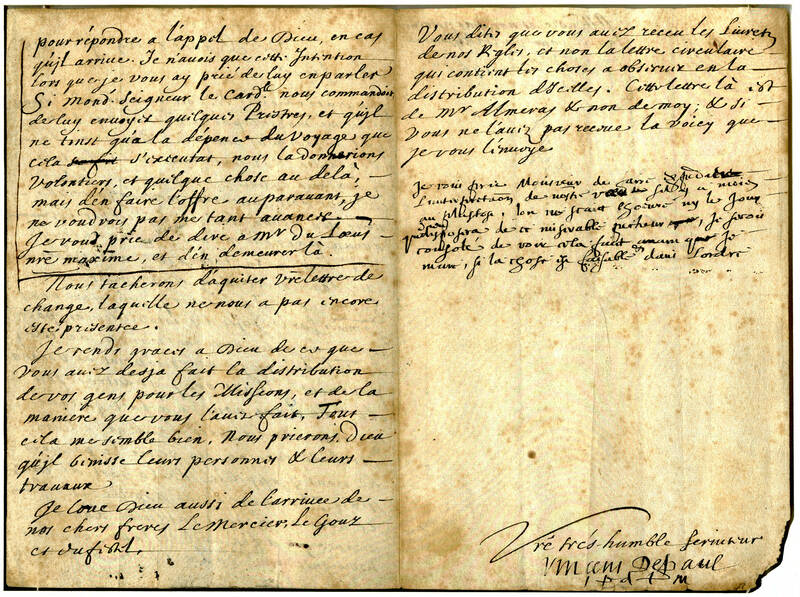 The above is a letter, partly written by St. Vincent de Paul, to Edme Jolly, a superior in Rome, dated Nov. 29, 1658. “We collect books that influenced Vincent in his thoughts and books for which he was an influence,” says Rea. “We endeavor to purchase materials that flesh out the world he lived in. To understand Vincent is to understand the time and place he lived.” In 2016, the university will celebrate the 200th anniversary of the Vincentians’ arrival in the United States with a special exhibit featuring materials from its Opening Day Collection, which includes approximately 1,000 volumes the Vincentians brought from Europe. Highlights include a 1537 edition of Herodotus’ history, a 1604 exorcism manual and a 1652 pamphlet on beekeeping. The Vincentian Collection also includes the DeAndreis-Rosati Memorial Archives, which contains the history of the Western Province of the Congregation of the Mission. Social justice activist and author Sister Helen Prejean, C.S.J. (DHL ’00), began donating her personal archives to the university in 2010. Letters and personal journals mix with speeches and awards that span 1967–2014. Research, manuscripts and correspondence with death row inmates used in her books “Dead Man Walking” and “The Death of Innocents” are among the most popular materials requested. “It’s an emotionally gripping, difficult collection to work with,” says Tikoff who welcomed Prejean to speak to her spring 2015 honors history course. 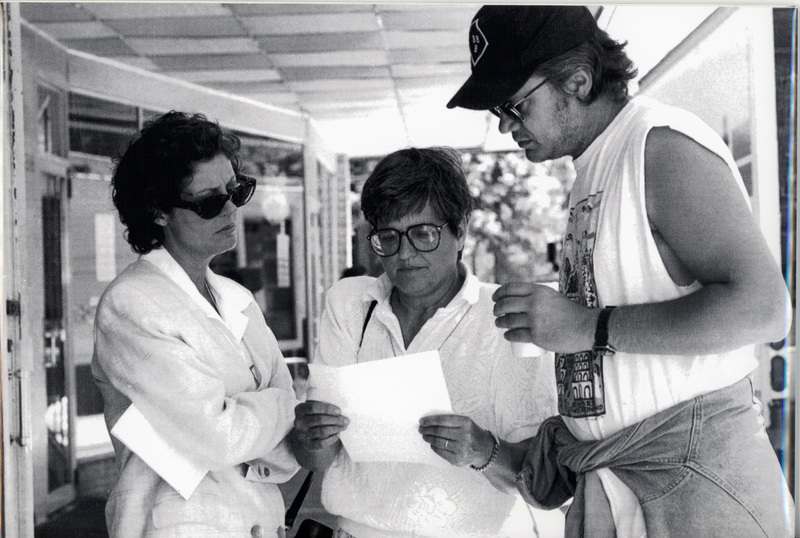 Many students are familiar with Prejean’s work through the 1995 Oscar Award-winning movie starring Susan Sarandon as Prejean. “Even if the students are not aware of Sister Helen’s work, once they have a little bit of background they are impressed and have an immediate reaction to the materials,” says Morgen MacIntosh Hodgetts, special collections instruction librarian. Hodgetts, along with David Bates and John Gieger from the Library of Congress Teaching with Primary Sources Program in DePaul’s College of Education, are in the process of selecting items from the collection for digitization. This will honor Prejean’s wishes to make her collection more widely available to students. 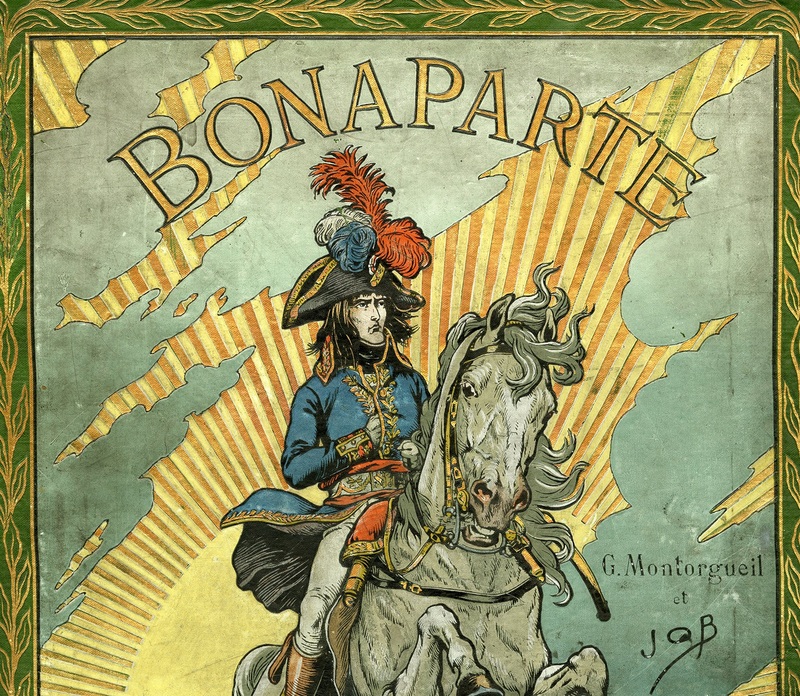 “Only the surface has been scratched, so it’s exciting to develop a way for students and teachers who are unable to visit DePaul to access primary sources that will enhance their reading of ‘Dead Man Walking,’” she says. Christopher Kimpel pored over selections from “Irish National Songster: Containing a Choice of Sentimental, Patriotic, and Comic Songs” for a research paper. The strong Irish studies collection allowed Kimpel, a music graduate student, to explore the impact of this book on Irish national identity. “It gave me a different view on how music was used in the past and how powerful music can be as a tool for enacting change,” he explains. While Kimpel hopes to stay in performance, his experience in special collections opened his eyes to the myriad resources available. That’s exactly why Music Instructor Anna Grau Schmidt brings her students to special collections. “This might be the culmination of any research they are going to do, but some of them find it gives them new ways of looking at and finding music,” she says. Nelson enjoys the multitude of uses for special collections. “The physical use of materials is guided by our responsibility to care for and preserve fragile and unique resources, but the intellectual and educational uses of the materials are open to the creativity, curiosity and discipline-specific interests of faculty and students,” she says. For those unable to visit Special Collections and Archives, select materials are available in its digital collections or as part of the digital exhibits. During the 1960s, the civil rights movement was in full swing. Across the nation, student protests erupted on college campuses, and DePaul was no exception. In 1968, the Black Student Union delivered a list of demands to then-president the Rev. John R. Cortelyou, C.M. (CSH MS ’43). 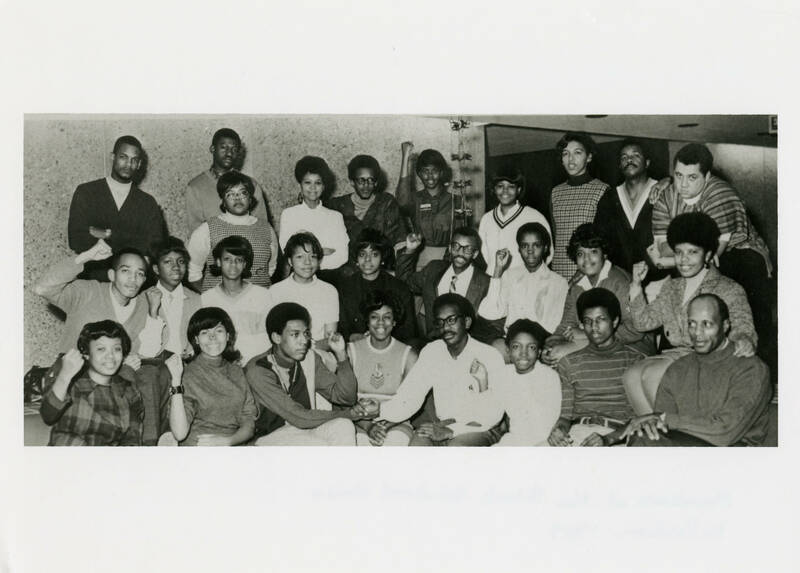 “There was a lot of activity, trying to get the administration to take more notice of the African-American students on campus and their student experience,” explains Andrea Bainbridge, university archivist. University Archives includes more than 230 separate collections that document DePaul’s history and culture, spanning the 19th century through today.